A weekly meetup with guest speakers, demonstrations and open discussion on topics related to transitioning to a lifestyle of optimal health through sustainability, prevention and preservation. Did you know that many herbs and roots attract beneficial pollinators and ward off destructive pests in the garden? And that planting certain types of blooms and roots near each other actually keeps your plants producing longer? The Native American Indians called their classic corn, bean and squash arrangement the Three Sisters method of planting. A big squash blossom attracted pollinators to the corn tassels so that the pollen knocks off onto the silks of the ears to make kernels. And the beans put nitrogen back in the soil that the corn uses up. 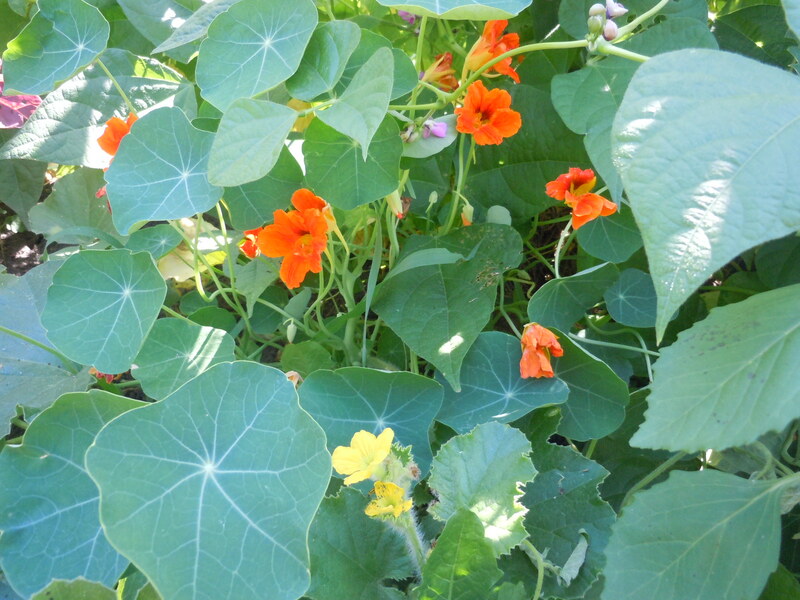 Nasturtiums in the garden attract pollinators with their bright blooms. Their blooms are also a great ‘trap’ for aphids which prefer this bloom over the neighboring veggies. And there are a few more neat arrangements that support higher yields, stronger plants and natural pest protection in the garden. Join us this coming Saturday at the shop to learn about planning your 2014 garden.